Web hosting is a service that allows organizations and individuals to post a website or web page on to the Internet. When Internet users want to view your website, all they need to do is type your website address into their browser. Their computer will then connect to your server and your webpages will be delivered to them through the browser. Most hosting companies require that you own your domain name in order to host with them. If you do not have a domain name, the hosting companies will help you purchase one.. Most of your current files (documents, pictures, software etc) are sitting there on your personal computer/laptop. Only you can access them, right? If you wanted to show those files to other people, you’d have to send the files to those people, think of web hosting as sending your ‘files’ to a whole lot of people. Your website is the file and essentially it’s being put up on the internet for people to view. So instead of having to send complex website files to people in order for them to be able to see your website, they’re able to simply type in your website URL and view it all there. A web host, or web hosting service provider, is a business that provides the technologies and services needed for the website or webpage to be viewed in the Internet. Websites are hosted, or stored, on special computers called servers. With all the different types of hosting available, it can be confusing as to which one is right for you. Do you choose shared hosting, a VPS, or a Dedicated server? In this article we will cover the basics of the different types of hosting plans so you can find which type is the right one for you. Shared hosting is the most classic and most popular hosting plan along most people on the world. Web hosting in which the service provider serves pages for multiple Web sites, each having its own Internet domain name, from a single Web server. The main reason why people pick this plan is that they actually don’t need more than that. It’s also usually the cheapest hosting option. Having a plan to start–up a venture using your own or borrowed capital. Expecting a low initial rate of visitors say 500 per day. Limited number of email accounts to be set up as you currently have only a limited number of employees. Planning to host and maintain only your web site and a couple of blogs etc. VPS hosting is more powerful than shared hosting, since everyone gets a nice private virtual server each. So technically, you get a nice chunk of server space etc for yourself. That’s a nice step up from the shared hosting option. So even though technically you’re on the same physical machine as others, you have your own little space – so no sharing with others. This usually means a better performance and faster loading speeds. Dedicated servers are often the fastest and most powerful choices available, though some of the high-end VPS options can give the lower performing dedicated servers a run for their money. Leasing an entire server on which to host your website. You get access to all hardware and software from your web server software right down to the operating system all for a very hefty price. Dedicated hosting is only for the heaviest of power users. The ability to control your own operating system often can mean your on your own when it comes to software support and by the nature of your own customization’s, should the hardware fail it can take more time to recover your site. If however you have security sensitive data on your website or a very high traffic load a dedicated server may be for you as you alone have access to the system meaning that all RAM/CPU/disk space/etc is under your full control. The result is that performance should be very predictable, which is very important for those who are planning on hosting e-commerce solutions or planning on monetizing their website(s) in other ways. Cloud hosting is an entirely different, I guess you could say it’s a little like renting. With normal hosting, you get a machine that gives you resources, like memory and CPU time. With Cloud hosting, you don’t have a machine. Your hardware is virtual, which brings a whole host of cool benefits. It’s pretty advanced and can be pretty cost efficient when compared with the other types of hosting, but it’s definitely something that is trending on 2015 and beyond. Many forums and blogs are been flooded with some post related to web hosting saying that it’s really difficult to find best quality and affordable web hosting services. We totally reject such assumptions. WebhostUK LTD, UK web hosting provider is happy to announce Specialized SSD Shared Web Hosting end of summer offer. Our UK Shared Hosting services come with large resources at affordable and cheap prices as compared with others. 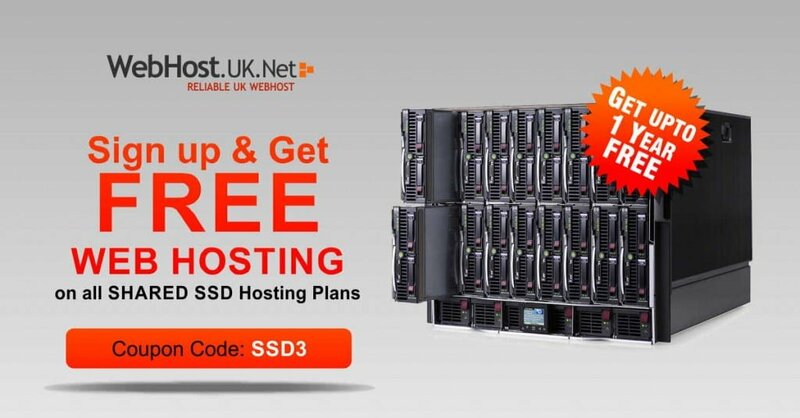 Sign up for WebhostUK’s any Shared SSD Hosting plan on Biennial term and get 1 year web hosting absolutely free. To avail discount make use of SSD3 coupon code. Customers looking for annual term don’t have to worry as we are offering 3 months hosting free with annual purchase of any Shared Hosting plans. WebhostUK LTD SSD Shared Web Hosting plans created and hosted on pure SSD drives servers. SSD drives provide fast r/w and data execution speed as compared to normal drives. SSD drive has less chances of hardware failure which is major benefit in case of hardware failure and avoiding data loss. Shared SSD Web Hosting plans are setup on Dual Quad Core Servers with 16 GB DDR3 RAM and RAID 10 Hard Drives. Our servers are located in best Datacenters physically located in UK. We also free addons like Attracta SEO Tool, Softaculous and Free domain with our plans. Shared Web Hosting plans starts at £1.25 per month. Selecting higher billing cycle like annually or biannually can save a large amount. NOTE: Free months for annual term will be added manually by our Billing executive after order verification. The Offer is valid till 31st Aug 2014. To know more about our services, visit Live Chat or email us at sales@webhostuk.co.uk. Don’t miss this opportunity…!!! Signup and save pounds.